Sesame Street has been a popular TV show in our house for a long time! My 3-year-old daughter, Ava, is such a big fan she even had a Sesame Street party when she turned two! Like most young children, she LOVES Elmo and his popular ‘Elmo Musical’ segment, which features new adventures in the monster’s pretend world. Elmo like young children is always learning new things and asking questions about his environment. Now young children can partake in more adventures with their favorite monster. 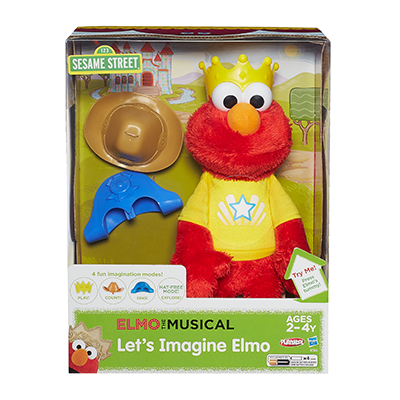 With the Let’s Imagine Elmo from Hasbro, Elmo has four fun hats he can wear that allow him to imagine himself in new roles – a cowboy, prince and sea captain. Children can unlock different play mode by placing a hat on his head. When your little one puts the prince hat on Elmo, he pretends to be Prince Elmo and plays a game of “Prince Elmo Says”. With the cowboy hat, Elmo counts up to 20 and sings a song when reaching 20. The sea captain’s hat lets Elmo imagine he’s an ocean-going captain, and he’ll start up a sounds-of-sea identification game. As with other interactive Elmo toys, our favorite monster is just as lovable being himself. He loves to interact by getting bounced ticked, and having his nose squeezed. This interaction is perfect for daytime fun. At night, Let’s Imagine Elmo can become a perfect sleep companion by turning off the interaction with a simple switch located on his bottom. I really hate toys that my daughter loves for a day and then forgets about the day after. Not only is it a waste of money, but it adds to the clutter I already have with an active 3-year-old! With Let’s Imagine Elmo, I never have to worry about this because he is much more than one toy. He keeps Ava engaged and holds her attention longer during playtime because of the four different hat modes. Plus, the ability to change the hats over and over again has made Let’s Imagine Elmo a toy she plays with all the time. Let’s Imagine Elmo is a great toy for children between the ages of two to four. Toddlers can learn how to follow simple instructions Elmo gives like pinching his nose while older children can extend their learning of numbers by counting past 10 with him. 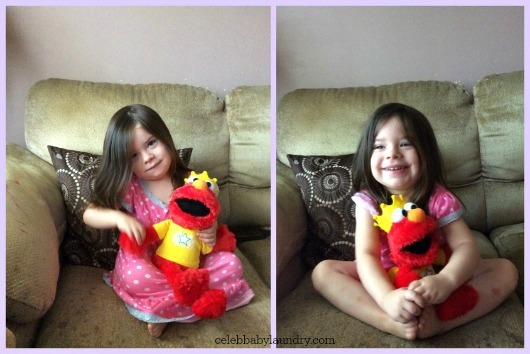 Ava loves to count, so she got a kick out of counting with Elmo. The cowboy mode really helped her move past counting to 10. Her second favorite mode is the Prince mode! She really enjoys pinching Elmo’s nose and rubbing his belly. The design of Let’s Imagine Elmo is a bit smaller than other interactive Elmo toys from Hasbro. This makes him a much better toy for learning. Young children will have no problem picking up the toy and his size makes him easy move around while taking part in the interactive modes. 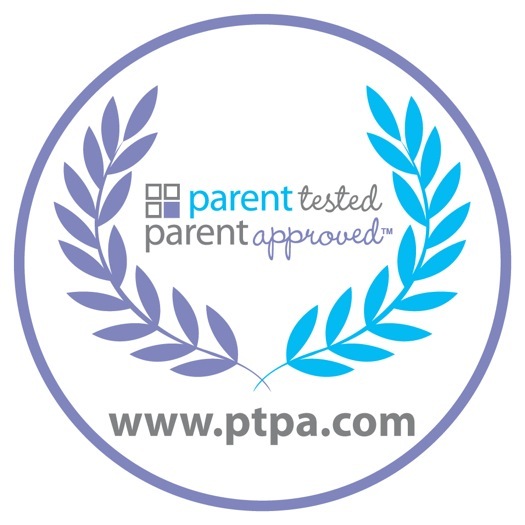 Let’s Imagine Elmo has also earned the Parent Tested Parent Approved seal. To learn more about Let’s Imagine With Elmo and other Sesame Street toys visit Hasbro. DO your children love Elmo too? Here’s your chance to test out the new Let’s Imagine Elmo! Enter the giveaway below and be entered to win (1) Let’s Imagine Elmo for your child. ￼￼￼￼￼￼￼￼￼￼Disclosure: I am part of the PTPA Brand Ambassador Program with Hasbro and I received compensation as part of my affiliation with this group. The opinions on this blog are my own.